While Houston certainly has enough to keep you busy, it’s nice to get away once in a while — if only for a day. Day trips from Houston are fun, quick, and affordable. Here are 10 of the best destinations that you can easily pull off in a day. Check out our infographic below, and scroll down to read about our favorites. Sacrifice just an hour in the car to enjoy all the beachy things Galveston has to offer. 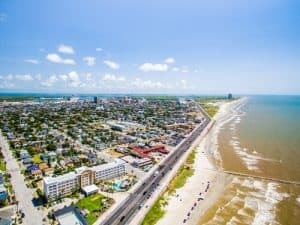 Eat and shop along The Strand, visit the historic mansions, and enjoy games and rides on Pleasure Pier. If you decide to stay a little longer, book a weekend getaway at a Sand `N Sea beach house! At Kemah, expect some serious fun — we’re talking Kemah Boardwalk, a stingray touch pool, and a vineyard. And the best part? It’s a measly 40 minutes away. This popular destination is enjoyable for everyone, not just college students. The George Bush Presidential Library is here, along with tons of shopping and restaurants. Don’t miss a campus tour of Texas A&M University. Drive time is an hour and 40 minutes. If you think Brenham is only about the ice cream factory, you’re missing out. Get a taste for country living and drive only an hour and 20 minutes. You can shop for antiques, eat at one of the cute mom and pop joints, and of course, do the Blue Bell tour. Only a hop, skip, and a jump away from Brenham lies the sleepy town of Navasota. Combine the two destinations, or enjoy Navasota alone. Be sure to check out Washington on the Brazos for some serious Texas history. It’s an easy drive of an hour and 15 minutes. 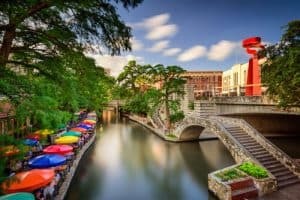 This small city is home to Baylor University, the Dr. Pepper Museum, and HGTV’s smash hit show “Fixer Upper.” While you’ll need three hours to get there, it’s well worth the time investment. Got a hankering for breathtaking historical sites and some knock-your-socks-off Mexican food? Check out San Antonio. Drive three hours and stroll down The Riverwalk, visit The Alamo, or spend the day at SeaWorld. In San Marcos, the laid-back vibe is contagious. This city houses Texas State University’s sprawling campus, along with some fabulous shopping and even a cave. In the summer, floating the Guadalupe or Comal River is a must. Drive time is 2 hours and 40 minutes. With a drive time of four hours, this one might be a bit of a stretch. But you won’t want to miss scenic Fredericksburg, known for two main things — wine and peaches. If you go in the summer, you’ll get to enjoy both! Any of these day trips from Houston would be a fun-filled destination. Why not make it your goal to see them all this year? Ameritex Movers is here to help with all your moving needs. Give us a call today at 713.484.6683.